The Rotary Club of Johor Baru Haemodialysis Centre (RCJB HDC) welcomes the public to join patients and their families on its annual Patients Day held on Sept 30 and Oct 1 at the Rotary Haemodialysis Centre in Johor Baru. On Patients Day, all are welcome to visit the Centre from 9am to 5pm to cheer up and encourage the patients who undergo regular haemodialysis treatment at the Centre. The RCJB HDC is the first NGO-operated Haemodialysis Centre in the region, initially set up in Wisma Abad, Century Gardens as a community service project in 1991 before they moved to the present premises in 2003. Then Sultan of Johor, Sultan Iskandar, officially declared the Rotary Haemodialysis & Hospice Center open in March 2004 and it continues to operate as a Centre licensed by the Ministry of Health. Now seven other Rotary clubs in Johor operate haemodialysis centres while more than 20 such centres have been established by other charitable organisations in Johor. Kidney or renal failure is a medical condition where the kidneys fail to adequately filter toxins and waste products from the blood while haemodialysis is a method for removing waste products and filtering toxins from the blood, using a special filter called a dialyser that functions as an artificial kidney. As an extensive water purification system is absolutely critical for haemodialysis, this Centre is installed with a Reverse Osmosis machine and 3,000-litre tank upstairs with a 1,200-litre tank downstairs. The Centre has 18 haemodialysis machines operating on two floors and a separate treatment facility for Hepatitis B Virus patients. Compared to the rates charges by private hospitals, patients registered with RCJB HDC pay a highly subsidised rate of only RM110 per treatment. The centre helps 60 financially challenged patients return to near normal lives after each treatment so that they can continue with their work and take care of their families. Welcome to the RCJB HDC on Patients Day, located at No. 4-N, Jalan Tun Abdul Razak, Susur 3, 80200 Johor Baru. For enquiries, Tel: 607 – 222 2433. An anniversary celebration is a good reason to get together and the 90th anniversary of our alma mater is even a better reason for a reunion of former schoolmates. Months ahead of the grand celebration planned with 90 banquet tables in a local restaurant, tickets were sold out. With last minute registrations, the organisers went all out to get the restaurant to fit another three tables into the ballroom for the celebration. My schoolmates and I talked about this special event when we met during our annual Lunar New Year gatherings and everyone indicated their interest to come for the school’s anniversary celebration scheduled in August. Through email exchanges, 28 confirmed attending and I went ahead to secure our tickets for the banquet. Friends, who have moved away from Johor Baru to live abroad and in Kuala Lumpur, Singapore and Kota Kinabalu, made their way back to JB for this grand reunion. While some had to leave immediately after the banquet, some decided to stay for the weekend. When they came back for annual festivals, most of them would be preoccupied with family events but this time when they were here for our school’s anniversary celebration, these girls were ready to spend more time together. Knowing that the banquet dinner would end late on a Saturday night, I suggested to have a slow start the next day and meet for lunch before exploring new sights in familiar old roads. It was an open invitation to all who wanted to venture out for a walk to see what’s happening in the area that was developing into an interesting heritage quarter. Some of our friends already had plans for lunch but they agreed to meet later for dinner. But a bunch who were keen to rediscover this part of JB, jumped at the opportunity for a walkabout in Jalan Tan Hiok Nee and Jalan Dhoby! I thought that it was good for my friends to start by enjoying the art displayed in the Johor Architectural Sketches Exhibition which was then on in Eh He Gallery, to get a glimpse of some buildings and sites familiar to them. And I was right! They just couldn’t help admiring the sketches of the two different artists who interpreted the details of JB’s old buildings so distinctly and beautifully. And while we were enjoying the exhibits, who should walked into the gallery? It was none other than Buz Walker-Teach, one of the artists being exhibited here! It was my pleasure to introduce my friends to Buz and I guess, it was his pleasure to show them some of his work and share his thoughts about those sketches. Then we trekked upstairs to experience the aural exhibit at the Classic Accents Art House as well as the art by some of the artists in the Eh He team. And who should walk in while were there? It was Yap Leong, Eh He’s Art Director, and he was delighted to share some highlights of the exhibits with my friends. It was good to surround ourselves with so much creativity but it was time to fill our stomachs so we made our way out into the afternoon sun. Hiap Joo, the traditional charcoal bakery was closed that day so we walked up the road towards the iconic Red House at the corner of Jalan Pahang and Jalan Tan Hiok Nee. We discussed lunch options in the area and as we rounded the corner to Jalan Dhoby, I made a beeline for The Replacement Lodge & Kitchen and the rest followed me towards its whitewashed façade. It looked like we were not the only late lunch guests because the café was crowded! Once we made our request for a table, we sat outside while they cleared and set it for us. I was recently introduced to the menu in this little café and I thought it would be just nice to have a meal and coffee while waiting for Elizabeth to join us. She came along shortly and after we enjoyed our meal, we headed back to Jalan Tan Hiok Nee. All of them have not been to the JB Chinese Heritage Museum and I suppose this was a good time for a tour. Along the way, we popped into Evangelione where Hwee Ling, our friend who is a doll collector, met with JB’s doll maker, Yeo Mei Ying. It was fascinating to see some of her unique handmade creations and miniature doll’s house, clothes and shoes! Then we went across the road to look at the art displayed in Art52Gallery. Eric Tan was happy to show us some of the new work by artist, Grace Lim – who happens to be his wife – and answered my question about that persistent little cat which appears in most of her paintings! At the JB Chinese Heritage Museum, I pointed to the guest book and asked my friends to sign in with their comments after the tour. At the counter, I met David, the curator, who was with an assistant who collected fees from my friends and issued the tickets but David waived the fees for me. I laughed when he said that he should be paying me because he’s aware that I not only often bring visitors to the museum, I also give them a guided tour! After we completed the museum tour, my friends took time to write in their comments in the guest book. Just next door, we discovered Pockets, a specialty shop with an eclectic collection of interesting but useable items. The young men manning the shop were probably just as curious about our group and when I introduced myself, they were clearly familiar with My Johor Stories! All this fun is making us thirsty and Table for Two, a few doors down the road seemed like a cosy café for a drink. Once we were assured that they have tables for more than two people, we fitted ourselves around two small tables. It was amusing to discover that their menu even offered nostalgic Coke floats and iced-lemon tea thirst quenchers! Time has simply flown by while we explored the new sights on these old streets and reminisced of a bygone era. It was just so long ago when we were students who walked these roads to go to the public library, a building that was situated at the current site of the City Council Office, next to the main Post Office. Our favourite stopovers along Jalan Ibrahim must be Johor Central Book Store, Ee H’ng provision shop that had a café that served ice-cream and refreshing ice-kacang and Kerala Restaurant for a quick snack of freshly made dosai. All these no longer exist here. This interesting and informative day together culminated with a dinner rendezvous where we continued to reminisce of the good old – bad old days and caught up with each other on our lives, families and careers in KL, Singapore and elsewhere. It warmed our hearts that the bonds of friendship formed in our youth, remains a firm foundation for the special relationship we treasure now and for always. Eddie Soh, the entrepreneur chef of the Taste Bugs group of restaurants and food services, is presenting more good food at Black Castle Bistro. If you are familiar with the delicious food served in the Taste Bugs chain of restaurants, now you can look forward to an exciting menu created in a dining concept where food is served on platters that are large enough to share. Fans of the Taste Bugs restaurants, with locations in Sutera Mall, Bandar Baru Permas Jaya and Taman Bukit Indah, may be disappointed that these outlets no longer exist but you will be delighted to learn that a similar menu is still available at Black Castle. Recently when I received Chef Eddie’s invite to the Bukit Indah outlet, his text message was an ominous line that read: “The Black Knight is coming to town…” with a picture of a Medieval suit of armour, all in black. It certainly piqued my curiosity because I’m a fan of the Dark Knight but the Black Knight hinted of something out of the Middle Ages. I met Chef Eddie several years ago when he opened his restaurants in JB and I learnt that he also offers consultancy services to restaurant operators not only for creative food preparation and kitchen management but also in sauce and seasoning recipes. With professional culinary training in Western cuisine from the Barking & Dagenham College in London, he has a decade of culinary experience in Europe including stints with the 5-star Savoy London and some of the finest restaurants and hotels in London and the Czech Republic. At Taman Bukit Indah, my eyes are peeled, seeking the signage that reads, Black Knight, but instead I find a picture of a crest that reads, Black Castle. A large poster of that black Medieval suit of armour that came with Chef Eddie’s invite, is on the façade and it confirmed that I’m at the right place. I realise that this restaurant is rebranded as Black Castle! I know I arrived past the usual dinner hour and I see diners lingering over drinks. Chef Eddie welcomes me and is wreathed in smiles as he introduces the new menu at Black Castle. After he observed that more and more diners are opting to share their orders, probably so that they can taste more items, this inspired him to create a menu with a range of food in larger portions that are suitable for sharing and savouring with drinks. All this talk about his food is making me hungrier, may be even hungry enough to have starters and a main course. So he recommended to start with appetizers of six pieces Grilled Oysters (RM38) – whole oysters flavoured with garlic ailio with a touch of butteryaki sauce and grilled in open half shells. Fans of fresh oysters usually savour the oysters with a dash of Tobasco sauce but even though Tobasco was provided with this serving, I prefer to eat the grilled oysters without any added sauce. Oysters is an acquired taste and even though the first bite may seem rather pungent to the palate, I find that with every next bite, the oysters taste even better! Chef Eddie confided that the squid they use to create a serving of Spicy Calamari (RM28) are large whole imported squids that are first marinated in a secret spicy sauce before being grilled in a bit of butteryaki sauce. The whole squid is served sliced into rings and drizzled in its own spicy flavours and a wedge of lemon is provided if diners prefer to add a few drops of juice for a sour twist in the taste. I pride myself in being able to handle a high degree of spicy hot but I must say that this Spicy Calamari can be a tad too spicy for dinerst who are unprepared for a zinger! Even after two appetizers, I’m surprised that I still have space to tackle the main course that Chef Eddie recommended: Espresso BBQ Beef Back Ribs (RM108). This rack of well-marinated beef is braised to tasty tenderness that while it’s not literally falling off the bone, it’s easy to slice and chew. Meat-lovers will agree that part of the pleasure of eating meat is chewing gently to savour the meaty goodness. I summon the waitress hovering nearby, not to place any more food orders, but to ask her to put the beef bones into a doggie bag for me to take home. I’m sure my four-legged friend will have just as much pleasure in gnawing those juicy bones! There is so much in the menu to enjoy, so I assure Chef Eddie that I’ll be back for more! A week before our national day, I was walking along Johor Baru’s Jalan Ibrahim to go to an event at Eh He gallery but when I reached its front door, my path was blocked by a crane truck with its boom raised against the wall of the building. to the crane operator to adjust the boom! I looked up and spotted artist See Poh Chen on the platform, calling out directions to the crane operator who was working hard to adjust the boom’s position to let her continue painting her wall mural. I recognized her design with mythical birds and whales and the familiar figure of a little girl wearing red and a blindfold from her mural painted on a wall within Eh He but here, the little girl was holding a huge bunch of coloured balloons. My curiosity increased when I spotted yet another wall mural rendered in a dramatically different style on the wall of the corner shop across the road. I got hold of Eh He’s Art Director, Yap Leong, who is also See’s husband, who filled me in on what he and his artistic team have been doing for the Petronas #tanahairku project. From where we stood, he pointed to another wall mural on the UMNO building at Jalan Segget and told me that several local artists have also been commissioned to complete their wall murals at four other sites in JB’s heritage area in time for the official launch before the national day. 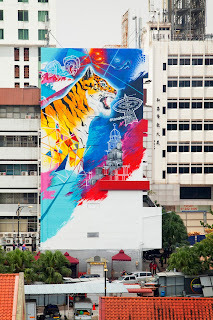 In the days before the Petronas launch event, I read a few Facebook posts with curious questions about the wall murals on several buildings in the heart of the city. Photos of these artwork on familiar streets was stirring up interest and I patiently waited for the launch event to get a clearer picture of what was happening to our city walls. Then I met with the artists who shared their thoughts about the artwork they had to complete in a short space of time. When the artists took me on a walk to look at their wall art, I learnt more about the artworks for the #tanahairku project that portrayed the artists’ personal reflections of Merdeka and its meaning to them. 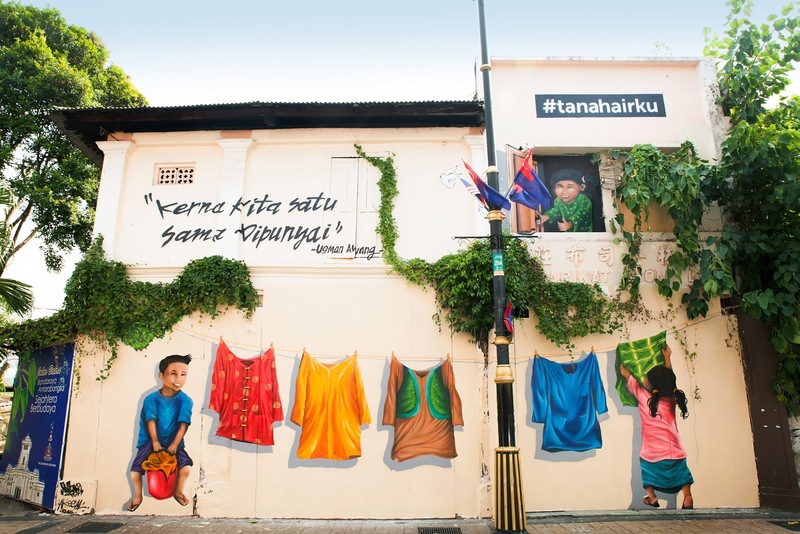 Taib Abdul Razak, better known as Taib Aur, a founding member of the Johor Sketchers, teamed up with Jefri Abdul (Jeps), to create their wall art on the wall of The Fitting Room at the corner of Jalan Ibrahim and Jalan Trus. 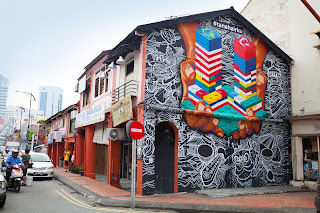 Entitled, Kita Jaga Sama-sama, this literally translates as “we protect together.” Their creative expression is boldly illustrated by a gigantic pair of hands holding twin towers of colourful Lego bricks that represent the National and the Johor flags. “JB is the home to the first Legoland Park in Asia so we decided to include the iconic Lego bricks in our design,” said Taib who explained that their design depicts a legacy of a nation and its state which in reality, is no child’s play. It rests in the hands of its people. With Malaysia’s rich multi-racial landscape, the need to protect the peace and harmony in our nation is crucial. Directly opposite, the façade of the Eh He building was covered in an intricate design with mythical birds and whales, and icons of the main ethnic groups featuring the familiar figure of a little girl wearing a red dress and a blindfold. Magical Land, the artwork by the Eh He team led by Yap Leong and See Poh Chen, tells the story of a girl’s journey into a captivating world where different cultures and traditions merge in a unique identity we call Malaysian. “The little girl is wearing a blindfold so as to listen more intently and begin to appreciate each other’s beauty in diversity,” said Yap who aims to remind viewers to learn from each other and work towards building a beautiful homeland where all can live in peace and harmony. Two blocks down Jalan Trus where the road meets Jalan Dhoby, I see the artwork on the wall of Roost Juice Bar by Muhammad Abqari Ahmad Shakri who goes by the moniker, Snake Two, and Muhammad Azri Zahri or Cuz One. Entitled, Bahtera Merdeka, the image of a war ship dubbed Merdeka, was sailing through obstacles and riding over waves of challenges to achieve independence, as a tribute to Malaysia’s naval heritage. The ship is painted against a background of the Port of Tanjung Pelepas while the adjacent wall is covered by the outlines of a nautical map. 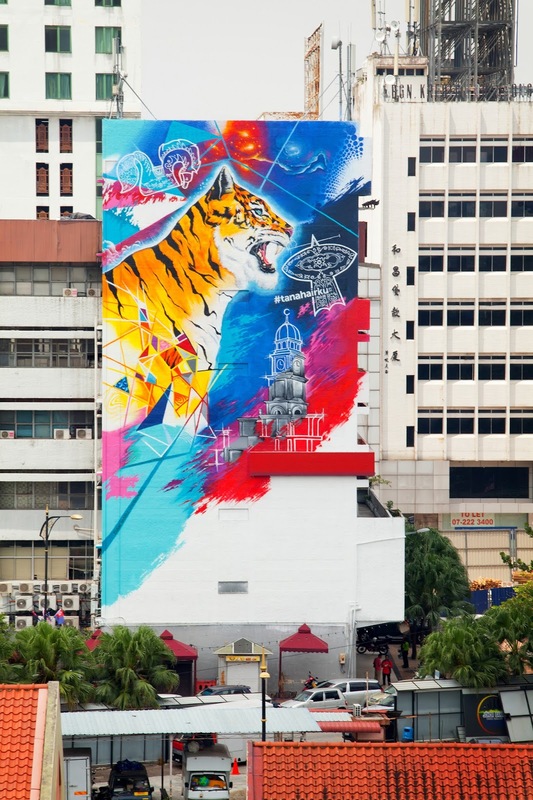 From where we were standing on Jalan Trus, the artists Iqbal Hareez Osman and Cheong Jiun Wei pointed to their towering piece of artwork that featured the profile of a roaring tiger painted on the UMNO Building at Jalan Segget. They explained that their artwork, The Tiger Roars, with an eye-catching roaring tiger, is a symbol of a sovereign nation, surrounded by modern development while it stands tall protecting the nation, undeterred by any challenges. 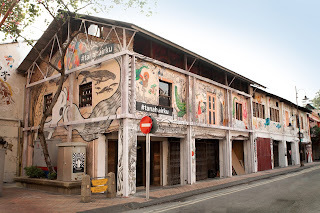 Just a few steps further up Jalan Trus, the wall of an old City Council building diagonally opposite Hua Mui restaurant has been transformed by the artwork by Muhammad Danial Awang Samad (Nellaone) and Iskandar Noor Rahim (Akeem). The art entitled, Muafakat, depicts two children hanging out clothes while their mother is looking out from an upstairs window. The traditional costumes they have hung out represent the 3 main race groups in this nation, all hanging on a clothes line that aptly portrays the concept of Muafakat where each race is irrevocably linked together! The national oil company, Petronas, has earned a reputation for their memorable festive TV commercials and I have my favourites by award-winning film director, writer and scriptwriter, the late Yasmin Ahmad. For the past two decades, Petronas has brought Malaysians together through heart-warming TV commercials that crosses cultural barriers and this year the spirit of National and Malaysia Day 2015 is celebrated by promoting love for the nation through the #tanahairku 2015 project in Johor, Sabah and Sarawak. A total of 22 street artists have been commissioned to paint 10 selected walls in JB, Kota Kinabalu and Kuching. Staying true to its commitment towards promoting social cohesion, the campaign this year also included a web-film and TV commercial entitled, akrab. Directed by Johorean, Quek Shio Chuan, this web-film set in 1957 about three boys, highlighted the value of friendship and perseverance – two elements that contribute to unity in a multi-racial community. The cast was introduced to the audience after this highly anticipated web-film premiered at the event. “Through the National and Malaysia Day 2015 campaign, we hope to present Malaysia as a unique melting pot of cultures and traditions,” said Petronas Senior General Manager of Group Strategic Communications, Liz Kamaruddin. “We strongly believe that the common values we share are what makes us Malaysians, a message we hope will come through in this campaign,” she added. Conceived in 2013, this is the third edition of the project by Petronas to celebrate Malaysia’s independence and emphasise its significance among the youth of the country. The inspiration for this project was Tanah Air, a 1956 poem by National Poet Laureate, Usman Awang. This poem was essentially an ode to the motherland, an expression of unbounded love for the country and the optimism of a nation on the verge of independence. In recent years, societies around the world have moved from regarding street art as a public nuisance to embracing it as a cultural asset that also rescues heritage areas from decay and deterioration. Petronas is aware that one of the main appeals of street art is its accessibility to people from all walks of life and there is no admission charge. 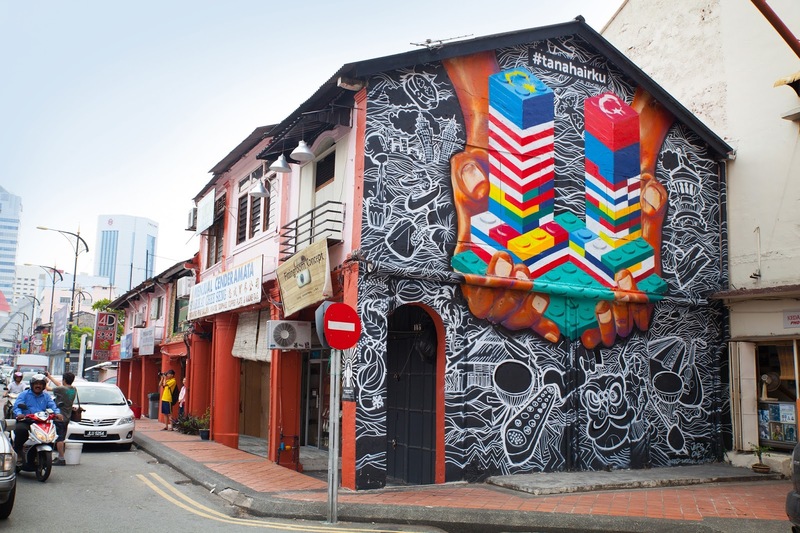 Street art is used as a medium to reach out and stir conversation because creative expressions have the power to transform people’s behaviours and serves as a subtle reminder to the younger generation as to what makes Malaysia special. “I trust that the Petronas #tanahairku campaign will encourage the generations born after our nation’s independence to feel a sense of patriotism,” said State Domestic Trade, Consumerism and Tourism exco Datuk Tee Siew Keong, at the launch of the project in JB. The soppy lyrics of an old song says, “The best love songs are written with a broken heart,” and by the same token, some of the best poetry must be written with a broken spirit. the award-winning documentary, "Cambodian Son"
This comes to mind as I sit in the dark with my eyes glued to the screen. The images that document the life of deported poet, Kosal Khiev, are real and relevant. With each passing moment of the film, I’m patting myself in the back for making it a point to catch the second screening of “Cambodian Son,” in the 12th JB Arts Fest. But at the back of my mind, I’m regretting that so many people who would have appreciated this, is missing it. This film was first presented earlier this year in the inaugural JB Film Festival and while I caught most of the movies during the festival, I just couldn’t make it to the screening of “Cambodian Son.” One of the key attractions of the film fest, in my humble opinion, was the opportunity to see some of the directors and actors after the screening, for an introduction and dialogue with the audience about the making of the film. When I read the Film section of the JBAF Festival Guide and discovered that “Cambodian Son” was scheduled for two shows in a weekend, I cancelled all other appointments to go for the film on Sunday evening. It was slotted for 7pm, right smack in the dinner hour so I sent a message to the JBAF secretariat to ask about the duration of the show. Their reply simply said: 2hr 15min. I arrive at the Black Box in the Mall of Medini just before 7pm to secure my favourite spot, thinking that since the show was Free-of-Charge on a weekend, there may be a crowd who are just as eager to watch this film. The film is directed by award-winning director, Masahiro Sugano, a pioneer in spoken word films. Sugano launched Studio Revolt, a collaborative media lab with a prominent presence in Cambodia. “Cambodian Son” garnered nominations in international film fests and was awarded Top Documentary Award, San Francisco CAAMFEST 2014 and Special Jury Prize for Best Documentary, Cultural Resistance Film Festival of Lebanon 2014. Kosal Khiev was a 1-year old refugee child who grew up as an Asian-American alien in Santa Ana, US. The documentary charts Kosal’s journey, transforming from teenage gangster to prison poet, surviving the American prison system and immigration policies that tear families apart and leave deportees to battle hardships. In 2011, at age 32, Kosal was deported and forcibly returned to Cambodia. The documentary shows how this deported poet struggles to find his footing in Cambodia, a country he hardly knows, and what happened when he received the most important performance invitation of his career – to represent Cambodia at the London 2012 Cultural Olympiad! I realise that director Sugano skillfully played the scene of Kosal’s father twice – once at the start of the film and later in the sequence of unfolding events – with his words translated in English subtitles. He did not qualify as a refugee to go to the US and ended up in France, instead. As I reflected on his father’s words, I cannot help but agree with him about the painful costs of war. Kosal’s spoken word poetry, presented with such passion, comes across as raw, painful, powerful and oh so beautiful. His American English is easy to understand and I can draw pictures from his words and expressions, spoken with so much angst and raw emotion. So absorbed am I in the film that a lump has formed in my throat and my eyes are brimming with tears. The film rolls to an end while I sit mesmerized by the experience. Dim lights cast shadows in the room but nobody leave their seats – maybe like me, they are also savouring the effects and digesting the contents of this film. Then I hear the announcement and I’m stunned when Kosal Khiev, the subject of the film, appears “live” in the room! Then he started to write down what these voices expressed – fears, hopes, dreams and nightmares. And late at night, he would go to the hole in the iron door of his cell and recite them. Prison inmates nearby who could hear him would encourage him to recite his thoughts and one guy who was good at doing the beat-box, supplied the rhythm for his spoken word. Sharing his thoughts and feelings with others in late night speeches, helped him get through the next 10 months in solitary. I listen with bated breath as Kosal recites a few pieces of his spoken word poetry and I can feel his pain from poems like, “God’s nightmare of me” and “Listen.” The air-conditioning in the Black Box is rather chilly, maybe from a new system or too few people in the room, and Kosal comes on wearing a jacket, scarf and hoodie to keep warm. But after the heated performance of his deep and dark poems, he soon shed the warm clothing to reveal his heavily tattooed arms and body! While we may not be able to fully identify with his deportee circumstances, he truly is an inspiration for budding poets and to those who made mistakes in their youth, Kosal is a living example of one who can turn his life around for the better. As its Kosal’s time to meet others for a chat, sign autographs and take photo mementoes, I bid him farewell and wish him well. Not just in his passionate pursuit of poetry, running poetry workshops with young people as an artist-in-residence at Studio Revolt but also that his desire to return to the US and reunite with his family, may be fulfilled someday soon. An 8-km charity run dubbed “Run4Fund” is jointly organised by Palm Resort Berhad and TJ Mart Kulai on Nov 7 to raise funds for the Palliative Care Association of Johor Baru (PCAJB). Palm Resort Golf & Country Club will be designing a golf course route on the Melati course, one of their three challenging 18-hole golf courses, to welcome non-golfers onto the course for the very first time. The evening Run4Fund, planned for flag-off at 4pm, will give participants the opportunity to enjoy the lush tropical greenery sprawled across manicured hills and interspersed with water features like ponds and streams. The charity run is open to participants in two Open categories for Ladies and Men with cash prizes of RM300, RM200, and RM100 awarded to the top three runners. “The cash prizes are a mere token sum because we aim to channel the bulk of the funds raised to benefit the good work by PCAJB,” said Palm Resort Golf & Country Club CEO and Le Grandeur Palm Resort General Manager, Jef Kong. At the recent launch of the charity run, the organisers explained that they decided on a route within the golf course to give non-golfer participants the opportunity to have first-hand experience of a golf course and to run in a safe environment, free from vehicular traffic. "In such challenging economic times, we have to be discerning about which organisation to pick as a beneficiary to ensure that the monies donated are used for the right purposes,” said TJ Mart Kulai owner, Lee Tet Long, who emphasised that the PCAJB was identified because the work they are doing with needy families will need more support now. While the Rotary Club of Johor Baru pioneered the setting up of the first hospice in JB to provide care to terminally ill cancer patients in 1995, the service evolved into an association dedicated to providing palliative care. "On behalf of the patients and their families, PCAJB would like to thank the organisers of the charity Run4Fund and all the participants for their kind contributions,” said PCAJB honorary secretary, Lee Soo Tong, adding that the total cost for providing their free service to patients, is estimated at about RM325,000 per annum. Registration fees for the charity run at RM40 each that entitles participants to an event T-shirt and finisher medals, will close at 12 noon on Oct 12. The privilege of behind-the-scene experiences is one of my job perks and I cannot forget the opportunity to observe Teochew opera artistes putting on their dramatic make-up, wearing headdresses and glittering costumes before the performance. Freddie Coleman! What is he doing there? This time, I’m in DoubleTree by Hilton Johor Baru (DTH JB) again but in the hotel’s back-of-the-house to observe participants for the Pastry Cup and Culinary Cup challenges in the qualifying rounds of the Hilton South East Asia Food & Beverage Masters. The selected participants will go on to the national level challenge that will culminate in the regional finals in February 2016. The 2-day programme kicked off with the Barista Cup and Bar Cup challenges, followed by the Pastry Cup and Culinary Cup challenges. On the first morning at the Food Store, I join a group of bloggers from Singapore, on a stay-cation experience and to watch these Cup challenges, and I’m delighted to meet my friend, Tony of Johor Kaki fame, among them! As the staff leads us into the back-of-the-house, unlocking door after door with her security card in a maze of corridors, I recall walking through similar corridors in a pre-opening tour of the hotel one and a half years ago, escorted by hotel general manager, Simon McGrath. Suddenly we are in a brightly lit space set up with kitchen equipment and told that it’s the hotel’s banquet kitchen. Participants for the Pastry Cup challenge are already into the first few minutes of their preparation and should serve their creations of one plated baked dessert and one plated frozen dessert in two hours. That's Tony and I posing with the poster! While Tony and I go around the workstations to observe the participants and snap some candid shots, Florence Liew, a friend who accompanied me at this event, makes herself comfortable at the counter set up for us. Back at the counter, I learn that the hotel is giving us a hands-on experience to design our very own cookies using the prepared dough for their signature chocolate chip cookies, while we are waiting for the pastries to be ready later. Trays of prepared dough and three items that we may use to decorate our cookies – raisins, chopped cherry cubes and multi-colour chocolate rice – are on the counter and the staff gives us pairs of gloves to wear. Then she demonstrates how we should put on a cap to cover our hair for hygiene reasons. As I snap on my gloves, I’m thinking that it’s been such a long time since I last handled any dough that I cannot even remember when it was! I tuck my hair into the cap and cannot resist checking in the mirror to see how I look and Florence is laughing and telling me that I remind her of female characters in some 50’s product advertisements. I just thought I looked like a hardworking charwoman! I quickly put vanity aside to dig my hands into the prepared dough and follow the staff’s demo to roll it into a patty before decorating it in my very own designs. Then we are told that the best decorated cookie will win a surprise prize! Florence is in her element, putting creativity into action by shaping the dough into a doughnut, a star, a duck, a gingerbread man, a girl’s face with braided hair and even a tic-tac-toe frame! Meanwhile Tony is sculpturing a shape that I think, resembles a swimming goldfish, complete with upright fins, among other interesting shapes, on the baking tray. Our cookies after they are baked! I, however, played it safe and kept my dough shapes in standard round patties. Then I hear the staff advising us to keep the cookie shapes within a size that would fit comfortably into the cookie tin and decide that I’m better off not being too creative with my cookie shapes! While I keep one eye on the participants in the Pastry Cup challenge, working hard to complete their tasks, I’m decorating my cookies with happy faces, complete with raisin eyes and chopped cherries for smiley lips, one with hair and another without hair but a mustache made of chocolate rice! The pace in the challenge is picking up and getting rather exciting so I decide that five cookies with smiley faces is enough and put aside my gloves to join the judges who are observing the participants at the various workstations. The panel of judges is made up of DTH JB Executive Chef Jaffery Othman, Executive Pastry Chef, Chef Ong Eng Kok and guest judge Chef Aziz Othman, who heads the Western kitchen in Istana Bukit Serene and prepares food for His Royal Highness, the Sultan of Johor. The judges admiring our designer choc chip cookies! But before the pastries are ready for judging, my nostrils are assailed by the fragrance of freshly baked chocolate chip cookies and I follow my nose to a staff who is wheeling in the baking trays with our baked cookies! No, the judges do not pick mine as the best decorated ones but I cannot help overhearing them discuss among themselves and pointing to the wild creations, saying they’ve found their favourite. When our designer cookies are sufficiently cooled, they are packed into cookie tins for us to take home to savour later. Mmm… cookies! The JB Arts Fest is here again! A travellator for a smoother border crossing?